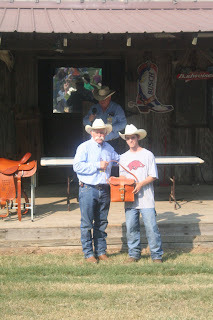 We've just returned from the National Chuckwagon Races in Clinton, AR. As usual, it was hot but the races were fantastic. 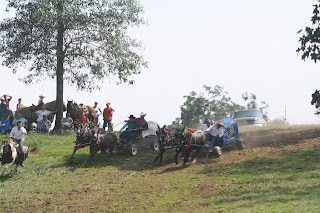 There were 5000 mules and horses on the site with more than 20,000 people in attendance. It is an amazing event and Dan and Peggy Eoff are incredibly crazy to invite that many people to their home in a weekend. I think the races were the best ever. It was great to see so many new people win this year. Will He Make It won the big mule team race and I don't think I've ever seen anyone as excited as their team was. Mr. Waddle said he'd been waiting for that moment for 17 years! Amazing - their team was amazing. Their outrider got on and was in perfect position. Congratulations to all the teams that won. Cole won the mule race and we were almost as excited as the Will He Make It team. Cole had a lighting run with a time of 46.8.